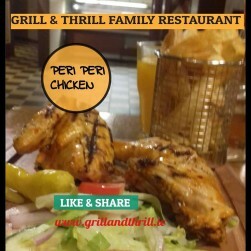 Grill and Thrill Takeaway Tralee - The easiest way to order takeaways online. Choose your food from a menu of your previous orders. 7 Lower Castle St, Tralee - Delivery from: €3.00. Greek salad is made with pieces of tomatoes,red and green peppers, sliced cucumbers red onion, lettuce, feta cheese and olives, typically seasoned with salt and dressed olive oil. Mixed leaf salad, onion, tomato, lettuce, cucumber with grilled quarter of chicken and house dressing. The famous parsley salad with cracked wheat, onion, tomato, lemonjuice and with dressed olive oil. Our falafel in mixed leaves with tomatoes, peppers and onions with a homemade cool mint dressing. Delicious short crust pastry filled with spicy potato filling. Mixed spiced vegetables wrapped in crispy pastry. Hot spicy chicken marinated with zing of lemon then deep fried in batter of gram flour. Potato patty stuffed with peas, daal and homemade spice cooked on grill. Specially prepared chicken roasted on an upright spit in our own special recipe. Specially prepared chicken roasted on an upright spit in our own special recipe. Comes with chips and a drink. Specially prepared lamb roasted on an upright spit in our own special recipe. Specially prepared lamb roasted on an upright spit in our own special recipe. Comes with chips and a drink. 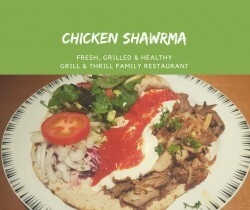 Chicken and lamb shawarma served with chilli and garlic sauce, lettuce, tomatoes, onions, red cabbage on naan brad or rice. Chicken and lamb shawarma served with chilli and garlic sauce, lettuce, tomatoes, onions, red cabbage on naan brad or rice. Comes with chips and a drink. Ground chickpeas mixed with spices and herb, deep fried served with chilli and garlic sauce, lettuce, tomatoes, onions, red cabbage on naan brad or rice. Ground chickpeas mixed with spices and herb, deep fried served with chilli and garlic sauce, lettuce, tomatoes, onions, red cabbage on naan brad or rice. Comes with chips and a drink. 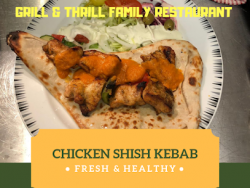 Fillet of chicken (boneless) pieces marinated in lemon juice and saffron, served with chilli and garlic sauce, lettuce, tomatoes, onions, red cabbage on naan brad or rice. Fillet of chicken (boneless) pieces marinated in lemon juice and saffron, served with chilli and garlic sauce, lettuce, tomatoes, onions, red cabbage on naan brad or rice. Comes with chips and a drink. Ground beef mince mixed with onions, spices, served with chilli and garlic sauce, lettuce, tomatoes, onions, red cabbage on naan brad or rice. Ground beef mince mixed with onions, spices, served with chilli and garlic sauce, lettuce, tomatoes, onions, red cabbage on naan brad or rice. Comes with chips and a drink. Lamb (boneless) pieces marinated in lemon juice and saffron, served with chilli and garlic sauce, lettuce, tomatoes, onions, red cabbage on naan brad or rice. Comes with chips and a drink. Grilled lamb chops served with rice or fresh naan bread and salad. 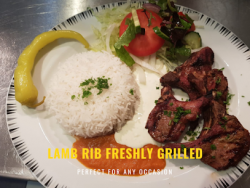 Grilled lamb chops served with rice or fresh naan bread and salad. Comes with chips and a drink. Only Available from 5PM To 10PM. A traditional spinach dish with touch of cream and butter. A mild to medium spicy dish. A medium spicy dish prepared with basmati rice with traditional Indian spices, garnished with coriander, lemon & tomato. Comes with Yogurt Salad. Ground chickpeas mixed with spices and herbs served with lettuce cheese and sauce. Grilled chicken fillet served with cheese, lettuce, tomatoes, onions and burger sauce in a bun. Comes with chips and drink. Comes with chips and drink. Ground chickpeas mixed with spices and herbs served with lettuce cheese and sauce. Comes with chips and drink. Comes with chips and caprisun. Choose from Chilli, BBQ, Mint, Garlic, Coleslaw, Peri Peri and Tamarind. Made with skimmed milk and our premium Italian ice cream. Choose from Oreo, Vanilla, Strawberry or Mango. 1 whole Peri Peri Chicken, 10 Pieces of Wings, Fries, served with salad and sauce. 2 whole Peri Peri Chicken, 16 Pieces of Wings, Fries, served with salad and sauce.